Decades before, in 1960-70's, this street was one of the busiest streets of Moscow. 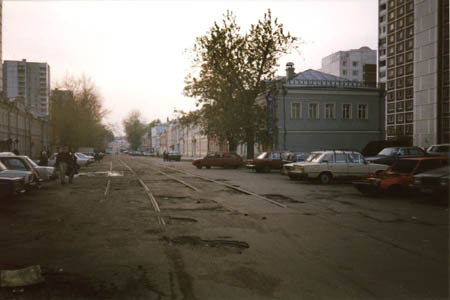 A tram line, constructed in 1950, was a part of a trunk line that connected the eastern industrial districts of Moscow with the city centre. 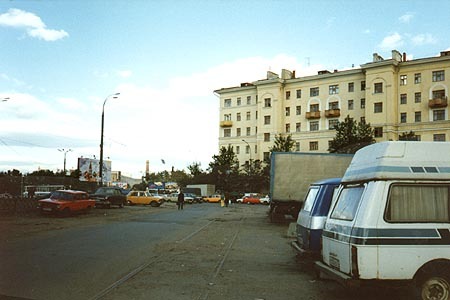 In 1980's the nearby Tulinskaya street was widened and converted into a highway, and the traffic was moved there. The tram line was also abandoned in 1980 as the parallel metro line had been inaugurated a few years before. Today Shkolnaya street is just an lazy lane with virtually no traffic at all. There were plans to make it a museum lane, but because of Perestroika and the following crisis these intentions were not realized. The first signs of revival of the lane became visible only after the millennial celebrations when the buildings were finally repaired. The street looks today way better than in nineties, but the tram tracks are buried under the new pavement. 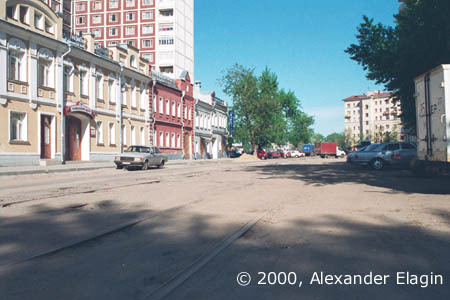 A new layer of asphalt has hidden the last traces of tracks in August 2000. 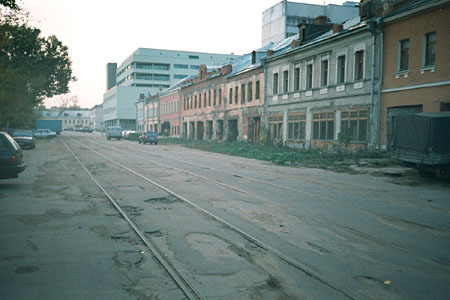 The tramway line was abandoned in 1980, but the rails were not lifted. They still could be seen for two decades, partly covered with asphalt patches, until the final layer was applied. 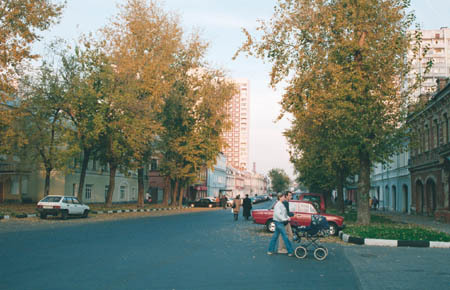 Looking towards Rogozhskiy Val Street from Shkolnaya Street in 1997. The old tracks were still in place, used for car parking. Underrestored buildings. It looked like nothing would help them in future, but surprisingly the reconstruction has made them trim and lively again. A few buildings had already been reconstructed by 2000. Currently, there are various commercial and financial organisations in these buildings. They do respect the "look and feel" of the street, that cannot be said about many other Moscow streets.